Oscar was depressed. Anxious and jumpy, he got nervous around new people. He was afraid to go in the kitchen. He sometimes ran away from nothing at all, as if he had just seen a ghost. Then he went to Reiki. Oscar is a terrier. His owner, Marla, asked that I not use her real name, or Oscar’s, because she’s mildly embarrassed that she took her dog in for Reiki, a treatment in which a practitioner lays or hovers their hands over a person—or a furry non-person, if you will—with the goal of balancing or healing them. Even though the idea was a little new age-y for her tastes, Marla was worried about Oscar’s anxiety and was open to anything. “I wouldn’t say I was desperate, but rather of the ‘entertaining all options,’ mindset,” she tells me. 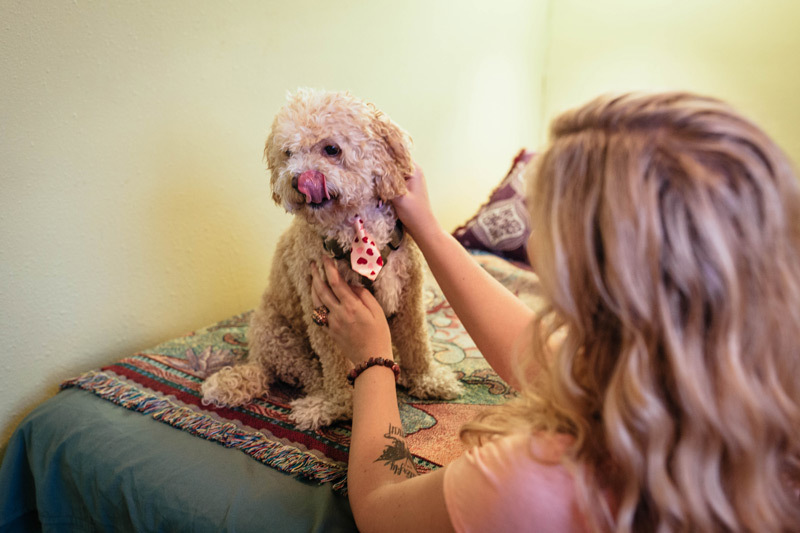 Los Angeles has a dog version of just about every human spiritual indulgence—massage, crystal therapies, church services, even yoga, for those looking to make their downward-dog more literal. Reiki is the latest. The official word from Science (AKA the National Institutes of Health) is that there’s no evidence this energy exists, or that Reiki actually accomplishes anything. Ostrand’s human clients have sought her out for any number of issues ranging from stress and anxiety to cancer. “I tell my students all the time: you can’t go around going, ‘I have the cure for cancer in my hands now.’ You don’t. For someone it could be the cure for them, but you don’t know,” she said. 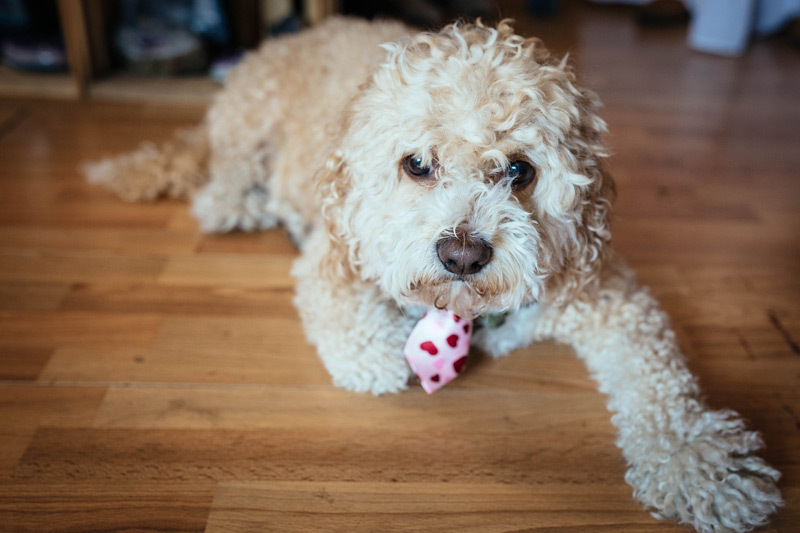 Recently she’s been seeing more canine clients, a trend that coincides, not surprisingly, with her move to Los Angeles two years ago. Other Reiki practitioners are branching out into the four-legged community as well. 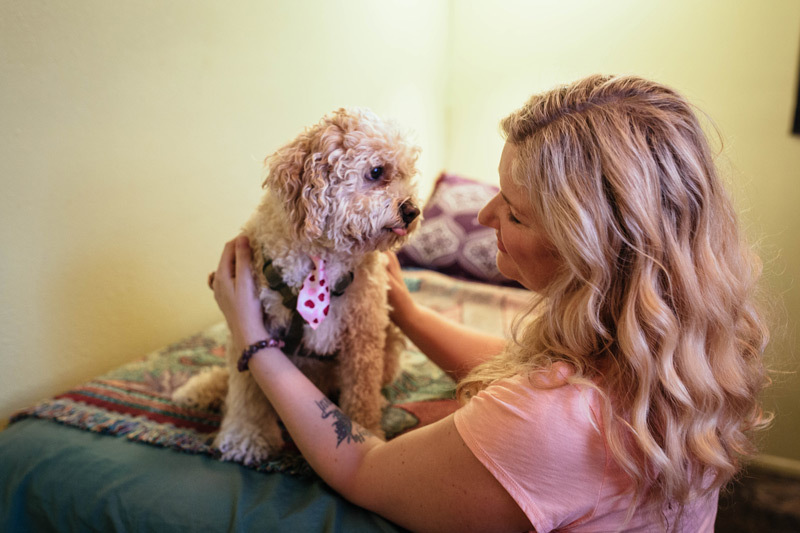 Search for “pet Reiki” in L.A. on Yelp, and 57 businesses are listed, along with hundreds of positive reviews. Ostrand never set out to be a dog whisperer. It just kind of happened. She tried Reiki at home on one of her cats who was anxious and had peed on a suitcase, because cats are nothing if not subtle. After the treatment, she says the cat’s behavioral issues subsided. How does she know? She sees it. The dog becomes calmer, more comfortable around people. The barking and biting go away, she says. According to Ostrand, anyone can become a Reiki practitioner and use the technique to heal others. After a one-day class, she says, you can walk out and give someone a Reiki treatment. What about a paw? I ask. I’m joking of course, but Ostrand nods. Wait. What? 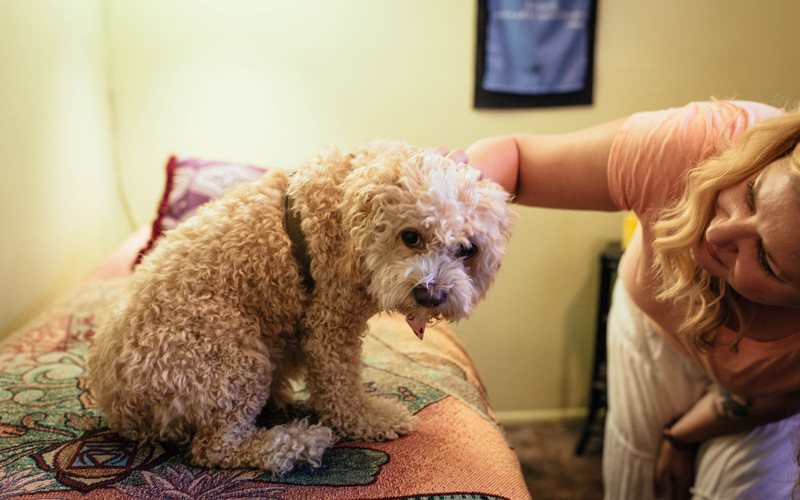 She tells me that until recently, she gave dogs treatments to heal them; it never occurred to her that a dog could channel Reiki and heal others. 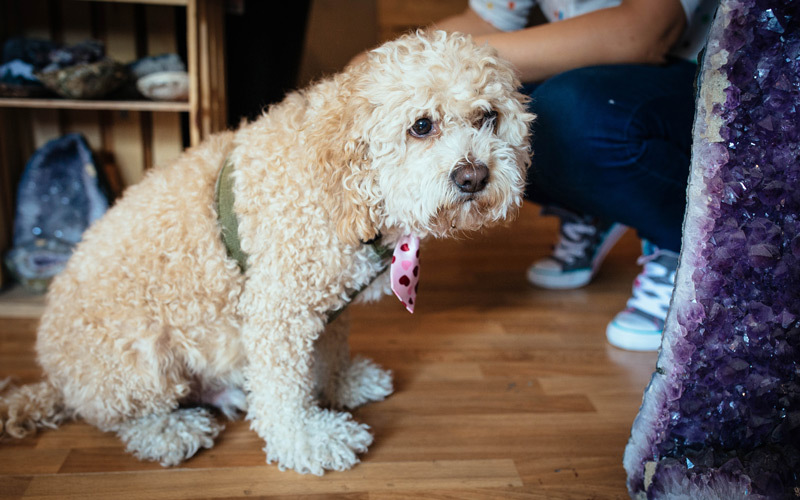 Then she met Chewie, the resident pup at Liberate Emporium, a holistic shop in Los Feliz where she sometimes teaches and treats clients. “Chewie channels Reiki and gives really great Reiki treatments,” she says, laughing. I laugh, too. I wonder if we are laughing at the same thing, so I ask for clarification: We’re laughing because it sounds crazy that a dog can give a Reiki treatment, right? Ostrand nods. “It’s hilarious,” she says, still laughing. “Chewie’s going to be a master level Reiki master!” She says that after a few treatments, one of the other workers at the store was holding Chewie on her lap and suddenly called out, “Oh my god, he’s giving me Reiki!” Ostrand felt his paw, and it was warm. “I could feel the energy,” she says. Some dogs heel. Chewie heals. Here he sits next to a geode. According to his owner, Cristina Dam, before Reiki Chewie had trouble getting up and down stairs. He seemed depressed and low-energy. She called him “Eeyore.” But no more. When I meet Chewie, he seems pretty mellow, but he’s curious and friendly. His sidekick, a tiny, white Bichon named Piggy, starts barking and freaking out when we all head to the treatment room in the back of the store. But once Ostrand puts her hands on Chewie, even Piggy calms immediately. Her eyes start to droop closed, and before long, it looks like Piggy’s about to fall asleep. Chewie sits patiently for a while, then jumps off the table and looks back up at Ostrand. In the high voice we all use to talk with animals, she asks him, “You want a little more Reiki? You want a little more?” He licks her nose.